Generate QR-Code 2D barcodes for free to encode a meCard business card barcode or URL. Modify the data and click the button below to generate a meCard barcode in a new window to save and share. 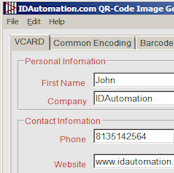 Alternatively, the IDAutomation QR-Code Image Generator Application offers high resolution image generation with automatic formatting and time-saving memorization features. IDAutomation also offers several other QR Code generation products including the QR Code Font.